Though he lived to only 37, prolific German director Rainer Werner Fassbinder directed scores of films in just a few years. Maybe it’s not surprising, then, that one remained largely forgotten. Just last year, Fassbinder’s 1973, 3-and-a-half-hour television miniseries World on a Wire was rediscovered, given a small theatrical release and issued on a beautiful Criterion Collection Blu-ray. The gap of almost 40 years only heightens the impact of this paranoid, extremely prescient vision of the future of technology. Based on a novel by Daniel F. Galoyue, the film is about a computer simulation program that perfectly recreates our world in miniature. For the electronic “identity units” existing, obliviously, within the computer simulation, their universe is every bit as real as ours. (This will sound familiar to fans of The Matrix.) But with the ability to play God, to create or delete a new identity with the push of a button, programmer Fred Stiller inevitably begins to question his own reality. Once we have the capacity to create an artificial world, we must accept that our world could be artificial as well. Or, as the film posits, there could be an infinite number of simulations both “above” and “below” our own. In an effort to uncover the truth behind his existence, Stiller begins to investigate a mysterious series of deaths and disappearances and shady corporate goings-on. 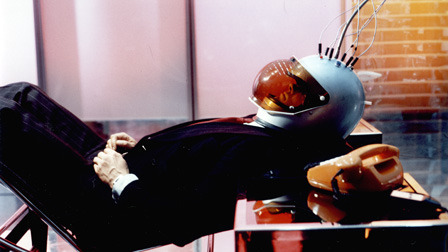 Fassbinder amps up the intrigue, fascinated by this blend of highly conceptional sci-fi and potboiler noir. Klaus Lowitsch, a compact pit bull of an actor, has the perfect tough faces and dramatic poses to play Stiller against a cast of dangerous company henchmen and sultry bombshells. Driven by the film’s small budget, the murder mystery elements of the story often outweigh typical sci-fi effects, but the philosophical underpinnings of the plot provide much more substance than most sci-fi films. Another, more problematic, effect of the film’s small budget is it’s flat, colorless production values. There are definitely some technical flaws, including poorly-executed zooms and other camerawork, but with his company of talented, regular actors and creative use of sound and choreography, Fassbinder does his mind-bending material justice.